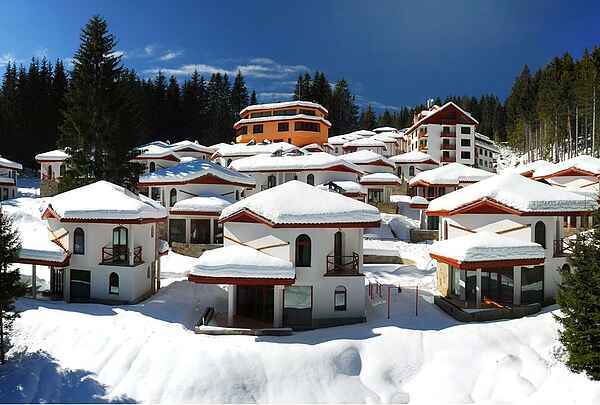 Chalets at Pamporovo Village offer luxury accommodation for up to 5 persons. We are featuring Chalet 25. This ski chalet has a traditional open plan living room with dining area, and cosy romantic home warming wood burning fire but has also got central heating. There are 2 sofas, a dining table and seating for 6. There is cable television and DVD player/family selection of DVDs Playstation/games and wireless I-Net (wireless internet). There is a fully equipped kitchen. Up the traditional wooden staircase, there are 2 shower rooms with WCs (1 is en suite). There are fitted wardrobes; each bedroom has its own balcony. There is a covered patio. you can sit and watch the beautiful sun-sets. The ski chalet is ideal for either families or groups of friends and is just across a small road from the restaurant and bar. Projects nearing completion include a spa, children's play area and a Kindergarten. This is an area of outstanding natural beauty. Larger groups can be accommodated by renting neighbouring chalets as well Cheap skiing/snowboarding deals available from 12 January. The Pamporovo / Pamporovo Village area Pamporovo is probably one of the three best places in the world to learn to ski. It is particularly suitable for beginners and children. It is also one of the three cheapest places in the world for skiing. It boasts an excellent ski school - possibly the best for beginners, and instructors speak good English. Ski hire and ski tuition are cheap when compared to anywhere else. A lift pass is about £100 and ski/board tuition is around £100 for 4 hours over 6 days. This compares favourably to anywhere (some European resorts charge £250for a lift pass during peak season). for snowboarding - The Snowshack - run by British enthusiasts/experts. There is a connection between the two schools so families and groups can arrange to ski and boardwithout much separation. Both schools are one of the best reasons to come to Pamporovo. Lessons (from beginner to advanced) are great value. The nearest ski slopes are at the middle staion of Studenets, where you can find the Ski school Steve. There is also the Black Horse restaurant. The Black Horse is also well worth a visit in summer - there is a small children's playground and you can sit and eat outside with fantastic views. interesting long reds. There is also an international slalom course to time yourself on. from pub grub, bangers and mash to T bone steaks. Vegetarian pizza ande pasta dishes. try the restaurant Rhodopsi Kat in Smolyan. the beautiful mountains and visit the Smolyan Lakes which are very close. There are seven lakes of Smolyan - the largest and most beautiful being "Muddy Lake". A short 15km drive away towards the pretty town of Shriko Luca you will find the Yagodina Cave which in parts is several storeys high, and is the longest cave in Bulgaria. (total length 10 km). Neolithic settlers who lived in the caves in the 6th millennium BC. There is a remarkable 42m waterfall in the Devil's Throat cave - so called because objects allowed to flow in do not flow out! The Trigradska River flows through the fantastic Dyavolskoto Gurlo (Devil's Throat) cave. Stretching 7,000 meters the water forms eighteen waterfalls and exits onto a canyon. It leads to the Trigad Gorge which is the most impressive natural sight in Bulgaria. Devin Spa is about a 35km Drive and worth a relaxing visit. Look out the the "elephant" natural rock formation nearby. In Devin you will find the Vacha Dam/reservoir where you could water ski or alternatively Dospat Dam hosts a number of water sports in which you could partake.. Don't forget the water canyons in Smolyan: this is a breath taking walk with magnificent views, you could try abseiling down one of the water canyons. hikes (with guide) and snowshoeing. In summer Via Ferrata, canoeing,caves, off road ATV, off road safari,excursions, mountain hiking, mountain biking, horse riding, Quad bikingBudget skiing in winter. Activity holiday in summer. Our mountain guide, Dicho, would be happy to arrangevirtually any activity. He is also a qualified ski instructor and will give lessons at very reasonable rates. If you want excitement Arda is well worth a visit, there is caving, bungie jumping and a whole host of activities. Quad bikes and bicycles are available to rent in Pamporovo and Smolyan. For a little fun try paintballing at Smolyan Lakes or a day's fishing. You may be able to horse ride to Greece from Arda. Group holidays can be accommodated. Our neighbours' chalet is available for rent. There is a possibility of horse riding holidays/pony trekking trips; which would use the chalets as a base. Just a ten minute drive away (a car can be arranged to take you there and bring you back). There is a riding school which caters for both novice and advanced riders. You can ride into the surrounding forest for anhour or trek into the beautiful scenery of the Rhodopes for up to 3 days. Ask for the riding guide Stefan. Ancient Plovdiv is contemporary to Troy and there are Roman ruins and Roman roads. There is a Roman amphitheatre still in use today. The lovely old town has been restored to its mid 19th century appearance. Plovdiv is definitely worth a visit. Modern Plovdiv is Bulgaria's second city. The children would appreciate a visit to the water park, Aqua Land in Plovdiv. For those wanting to see more of Bulgaria, why not consider a two centre summer holiday with a week at the chalet and a week on the Black Sea coast. Most car rental firms will allow a pick up and drop off at different airports. nice beach destinations within a 4 hour drive. than a return flight from Kavala. (The flights go into Kavala). We recommend car hire from for cross border. Other:	Linen and towels provided. The living area of the chalet is 121 square meters and it stands on a 200 sq meter plot. bedrooms could be arranged either as a double bedroom or as a twin bedroom. Forest Nook 2 is a secure community. There is a little drive to the hamlet - space for snowball play and ideal for children. A children's play area and Kindergarten are being completed. In summer there is space for play on the grassy areas and there is a communal swimming pool. There is a covered patio where you can sit and watch the beautiful sunsets. Both double bedrooms have their own balcony. Pamporovo/Forest Nook is situated in an area of outstanding natural beauty. Perelik peak with Smolyan and its lakes. There are also plans to link Pamprovo with Mechi Chai, the nearby ski resort at Chepelare. For those wanting to ski on longer red runs this will be a great bonus. Advanced skiiers and snowboarders can already ski/snowboard to Chepelare (wtih a guide/instructor). It is a short drive away. It is hoped this will transform the Rhodopi mountains into the biggest ski area in Bulgaria. The brand new Perelik Golf Course is being built at the foot of the Rhodopi Mountains. A new motorway has recently been completed through the mountains linking Pamporovo with the Greek Aegean coast. Winter or summer , Bulgaria is the cheapest holiday destination in Europe.